Due to very bad rains in chennai we lost contact with our family in chennai for the past 3 days. The water entered into the house and they moved to first floor. Thank god, finally we spoke to them yesterday and good to know they are safe. But still many parts of chennai are badly hit and lets all pray for them and for sure things will come back to normal soon. Dry roast the rava in a pan keeping it in a low flame. Be careful not to change the colour and at the same time ensure it is roasted properly. 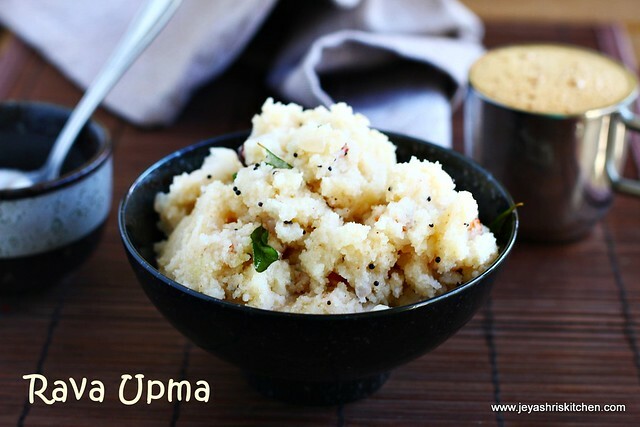 If not roasted well upma will not turn out fluffy. Keep the roasted rava aside. Chop the onions finely and slit the green chili. When the dals turn golden brown add the finely chopped onions. When the onions turn pink add 2 cups of water to this. Add salt. Allow this to come to a rolling boil. Meanwhile keep 1/2 cup of hot water ready by the side. 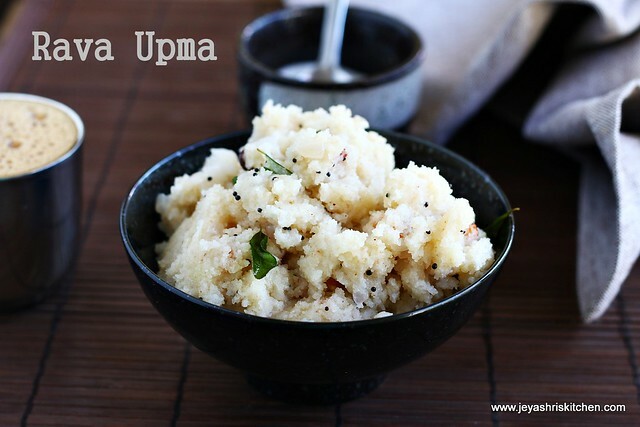 Generally for rava upma it takes 2 cups of water for 1 cup of rava but it differs from brand to brand. Some rava will absorb more water. So in the last if needed we can add this hot water. Lower the flame now and add the roasted rava to this and mix well without any lumps. If you keep the flame high and add rava it will form lumps. Once this is mixed well, you could make out whether it needs more water ot not. If you see sooji still not cooked add 1/4 cup of water, mix well and cover with a lid and keep it in low flame for 3 minutes. Take out the lid and mix well and fluff it up with a fork. 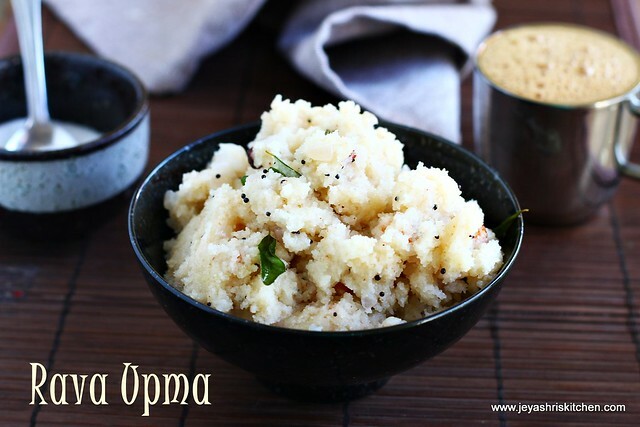 Rava upma is ready to serve now. I love to eat with pickle with a hot cup of tea or coffee aside. Even with sugar also it will be very tasty. Roast the rava well without getting it burnt. You can add finely chopped or grated ginger while adding the onions. After adding rava ensure the flame is very low, to avoid getting lumps.